Sometimes standing isn’t possible. It is often pain or sadness or exhaustion that “takes your legs out from under you.” Sometimes it’s prayer that drives us to our knees – a position of humility and vulnerability. And yet, sometimes, we cannot stand for our sense of awe is too great. O Holy Night invites us all to “fall our knees,” that we might hear the angel voices and, with wide eyes, see the Divine night come to us again. Christ is born! Anything is possible! And. Here. We. Are. Christmas Eve. Can you believe it? You are literally here… like a dot on the Directory Map at the Mall. I’m so glad you’re here. I love this night. It really paints a beautiful picture of Christmas. It’s full of friends and family come home. There’s a light chill in the air and soon a candlelit room that can’t help but leave you hopeful. There are many traditions associated with this night. It’s a bit predictable in that way but there’s always a magical surprise or two as well. 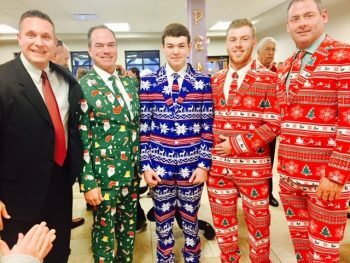 Last year, I was pictured with some of the Phillips clan right after service who decided the baby Jesus needed to be announced with a little flair. Something else happened last Christmas Eve that was not necessarily extraordinary to most but created a marvelous happenstance tradition for me and my middle son, Dane. The Brileys always have two vehicles here on Christmas Eve as I come early and stay late and Carrie and the kids come on their own. The last couple of years, however, Dane has stayed late with me so we can ride home together. We park down the road a bit so that we don’t take up a parking spot in our lot for all of you who will be joining us. This makes for a nice, still-humming-silent-night stroll from the building to find our car was everyone has departed. This has meant we walked past the pedestrian bridge that spanned over Harvard Avenue. And with that wrap around ramp to get to the top, what kid wouldn’t want to run up there at night on Christmas Eve. So… Dane and I have run up the ramp, stood in the middle of the bridge looking back at the church – now dark and silent with few, if any cars, driving underneath us. We just stand there for a while, marveling at the events we just celebrated at the church, giving thanks for the gift of Christ, the mystery and miracle of it all. After the frenzied activity of the weeks leading to that celebrated moment, a silent moment with my son on that bridge was as sweet a moment of worship as I had come to know. But… as you know if you’ve been around here a while at all, that pedestrian bridge was torn down just a couple of weeks ago after standing for nearly five decades. I’ll admit that my first thought when I learned the news was that I’d miss standing on that bridge with my son on Christmas Eve. Which prompted my second thought: “Where are we going to stand this year, to look back at the church, to marvel again at a holy and sacred night? How am I supposed to see Christmas now? As I was pondering that very thing, it led me to the question of Christmas Eve I’d like you to consider tonight. Where do you stand when you can no longer stand where you used to stand? This was now a bigger question than physically standing on a pedestrian bridge on Christmas Eve. For you, this may be a disorienting Christmas. Things are different this year. You are different this year. The story of Christ never changes but we do so it hits us differently every year. The events and shifts and relationships and experiences and questions and mysteries and all that you’ve encountered since last Christmas shapes the way you approach this Christmas. It changes your perspective. You can no longer stand where you used to stand when it comes to looking at Christmas. You may be here… in this space on Christmas Eve but you may feel like you’re a million miles from Christmas. 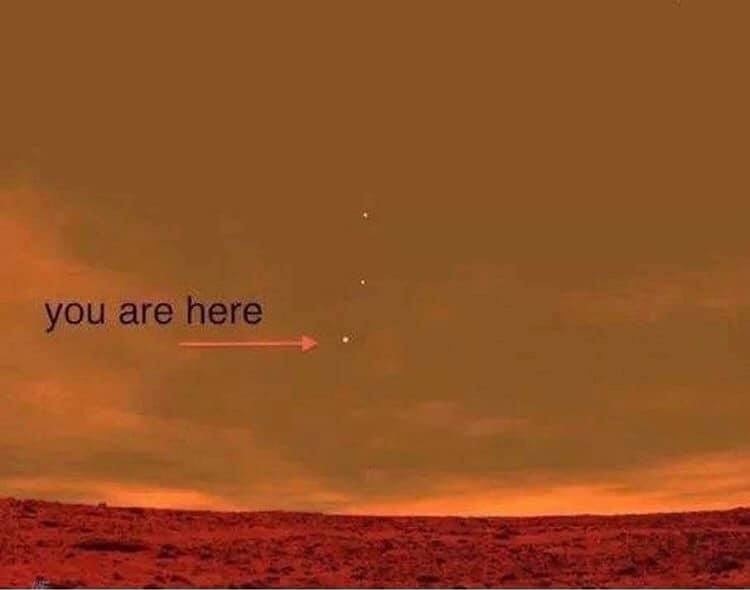 I saw this picture recently taken by the Mars Exploration Rover Spirit. 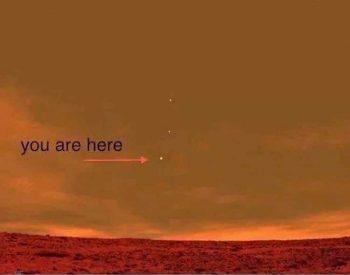 It’s the first ever picture of Earth from Mars and included the helpful Mall Directory note: “You are here.” It is an image capturing a remarkable reality. “You are here.” A dot. 34 million miles away from a camera that fellow humans landed on another planet. As marvelous as that is, it may represent in another way how you’re feeling about Christmas this year – distanced, small, unable to make out many of the details. I wonder if Mary and Joseph felt a bit like that too. They were on board with the game plan but who’s kidding who, there had to be some sense of pain and smallness to the whole thing too. They had no perspective other than the immediate. Christmas didn’t hold any of the tradition for them that it holds for us. It was just the culmination of an unexpected promise with threats of exile from their family and community and death from the empire who was threatened by the word that a new King was coming. Mary and Joe were surely both asking themselves the question, “Where do you stand when you can no longer stand where you used to stand?” Everything was upended. This was new territory. Joe wasn’t having a cigar out behind the stable. They weren’t taking holy family selfies and snapchatting them out to their friends. They were probably just trying to survive that first Christmas. Can you relate? You’re sorting through the loss… the absence… the heartache. It’s impossible to stand where you once stood in relation to Christmas. Too much has changed and you’re just trying to get through it. Where do you stand when you can no longer stand where you used to stand? The Shepherds had an entirely different set of concerns when it comes to where they stood with Christmas. They’re on the hillside watching the flock as best they can. As they’re downing a 5-hour Energy Drink to stay on their game, they’re blindsided by an angel choir which was not a typical occurrence on the night shift. The Shepherds were afraid. The angel laid out for them what had occurred in Bethlehem and as much as they wanted to deny what they had experienced, they couldn’t shake the fact that it did. They could no longer see the world the same way they did the day before. 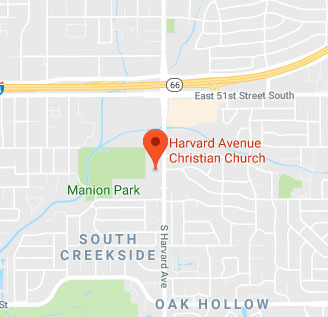 This news of a Messiah born in their neck of the woods – whether they wanted to believe it or not – was now on their radar and they would have to wrestle with such a reality. Maybe you’re like the Shepherds. You’re minding your own business in the world, getting’ yours, focused on the drive of the culture, the need to succeed, or just working the daily grind from 9-5 or even the night shift. From where you stand, Christmas is of no significance. Who needs it? In fact, the only religion that interests you is religious satire that is good for a laugh. One of my favorites of late was this artwork that says, “As for me and my house, we will serve tacos.” Book, chapter and verse? 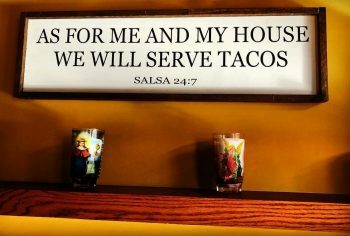 Salsa 24:7. It’s easier to keep our spirit’s thirst at bay by laughing off faith as nothing more than a crutch for the weak. But then… the grind grows weary. And money isn’t satisfying you the way you thought it would… and you’re maturing and something has shifted, maybe even a little bit, where the things you thought would fill you just don’t fill the void. There’s an emptiness… and for every hypocritical Christian you know that you can point to as reason you don’t do religion, there’s a spiritual desire in you to get closer to this Jesus – who without all the fanfare we put around religion – is really intriguing to you. As much as you’d like to just bah humbug the whole thing, you’ve got this nudge in you that longs to confess (if even internally) … “I need something more. I need God.” You decide your cultural stance in life can’t be the end game to it all. Where do you stand when you can no longer stand where you used to stand? Whether we are forced by circumstances out of our control to get a different view of Christmas this year or we’re spiritually churning in a way that won’t allow us to move through another Christmas with a business as usual mentality… here. we. are. … seeking, wondering. How will we stand with Christmas now? Sometimes, when it comes to such a holy moment, we shouldn’t stand at all. 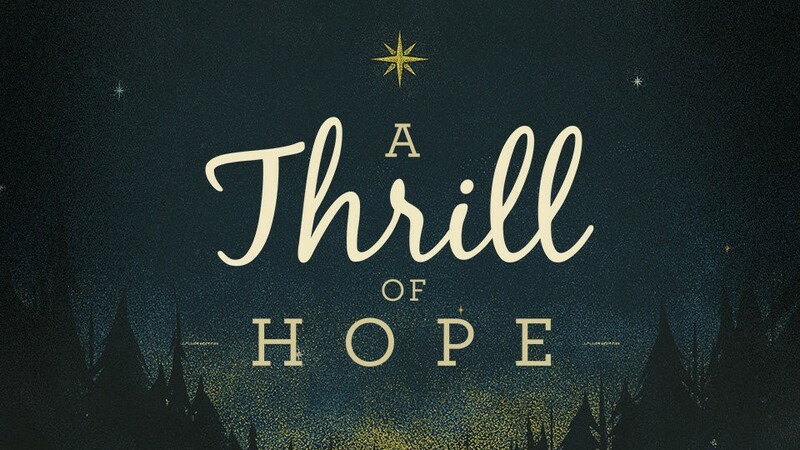 That beautiful Christmas song that has been our focus this Advent season offers that very advice. “Fall on your knees. Hear the angel voices. For on this night divine, Christ is born.” Have you slowed your roll at all this season… to simply get on your knees and worship the Lord? Have you celebrated the fact that you are not God and you don’t have to be? Have you marveled at the wonders of what it means to be here, alive, seeking meaning and wholeness and purpose? Sometimes, you have to position your life, even your very body, differently so that you can see that God is here and you are not alone. Sometimes you can’t understand where you stand until you’re not standing at all. As I was starting college, I moved an hour from home and was looking to room with my older brother, Matt, at the Gatehouse Apartments in Columbia, Missouri. It was not the nicest accommodations by any means and we didn’t have much stuff to make the place all that homey. But… I was going to be out on my own for the first time, sorting out this new phase of my life. No way things could look the same as they did before. Life was moving on and I was going to have to decide how I would move along with it. The very first night I stayed in the apartment was before I had moved in. It was just a scouting trip. I had come down to stay the night and look for a job that would support me while I was a student. Somebody had to pay the rent and buy the cans of tuna and generic cereal that fed us most meals. My brother was actually not going to be home that first night so I was going to be there alone. That was okay but also left me with some of those uncertain feelings about being by myself in a strange place. Not having my stuff there and Matt being gone, I went to lay down in his bed for the night. When my head hit the pillow, I opened my eyes and behold, just a few inches from my face, was the windowsill that projected several inches out from the wall. I was glad I hadn’t hit my head. It was a little tight. The bug light outside of the window brought enough light into the room through the broken blinds that I could tell there was something written on the underside of the windowsill. In big letters, it simply read, “Matt was here.” I shook my head a bit, and maybe even chuckled out loud. You’ve seen that sort of thing on trees or picnic tables in the park or at a rustic camp cabin where kids stay for a week in the summer and leave their mark on the walls as proof of their experience. But I laughed at the thought of my twenty-year old brother laying there in bed one night, grabbing a pen and scribbling the words, “Matt was here.” As strange as it may seem… as simple as those three words were… it was the most beautiful gift to my soul in that moment. My brother, whom I loved and admired and fought with and who had fought for me through all those years was strangely there with me. I never would have seen that standing up. Until I laid down, I could not sense his presence. Where do you stand when you can no longer stand where you used to stand? 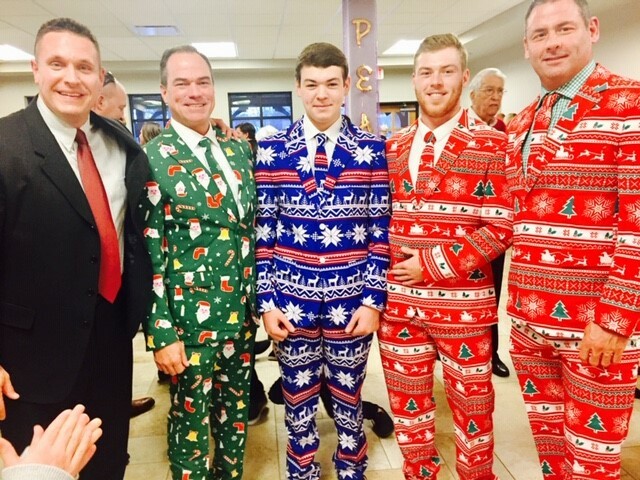 When it comes to Christmas, maybe you don’t stand at all. You fall on your knees.